This article includes tips for managing app store optimization, based on five of the most common mistakes that we see when auditing client campaigns. For a walkthrough that includes more detailed tips and commentary, check out our YouTube Apple Search Ads video playlist, such as our recent 3 Search Ads tips video, and for more detailed coverage of topics like search match, bidding and how the search ads auction works, browse our Apple Search Ads blog posts page. 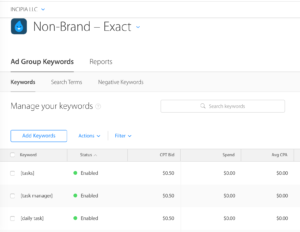 If you aren't using exact match types in your Search Ads campaigns, then congratulations! You've got an easy optimization win. When adding new keywords, the match type defaults broad, requiring you to either add brackets  around your keywords or change the match type to exact when adding a new keyword(s). You cannot change a keyword's match type after it is added. Raises your bidding confidence: There is only once possible search that your keyword will show an ad for, meaning that you can bid confidently for that search and be sure that you will only receive more/less traffic for that search or pay more or less for taps from that search. Raises your attribution confidence: You know that any installs and other performance attributed to that keyword (per the last tip below) are only generated from that one search, vs any one of many other search terms. Not only do you want to bid on exact match types, but you will also want to add all of those exact match keywords as exact match negative keywords into your broad match and search match campaign/ad groups, to ensure that every time someone searches that keyword and you show an ad, you know that only one keyword is eligible for that ad impression. Again, this reduces variability and enhances your confidence in managing your Search Ads campaigns. Additionally, be sure to sift through your search term reports from your search match and broad match ad groups to add performing search terms as new keywords and add underperformers as negative keywords to block future traffic. Check out our match types post for more operational details on match types. 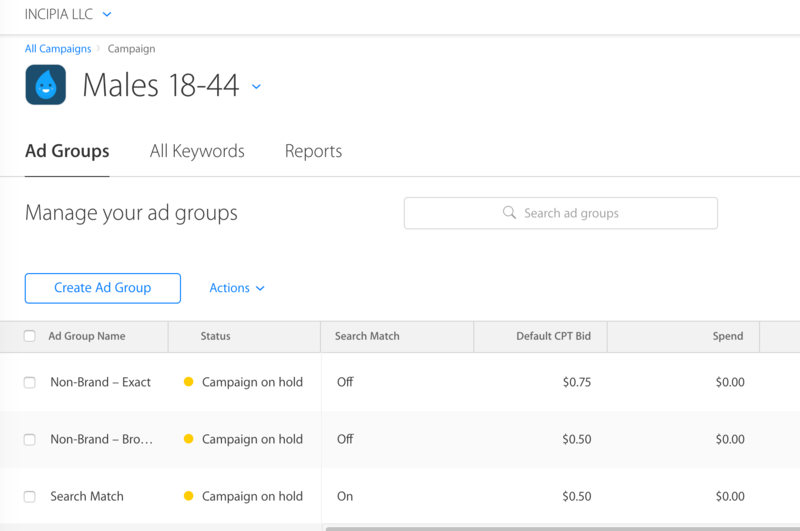 Search match is enabled by default for every new ad group (because Apple wants your ads to be eligible for as many impressions as possible), and because of this, you may unwittingly have search match enabled for a keyword-based ad group or campaign. It is not wise to use both search match and keywords in the same ad group, because of the exact match need per point #1, and because you will also want to control your search match bid (whether CPT or CPA) separately from your keyword targets. Additionally, you'll want to continually move search terms out of your search match target and into your broad/exact match keyword targets, which isn't possible if you have a mixed search match + keyword targeted ad group. Target CPA is useful if you have a constrained budget and a low goal CPA. 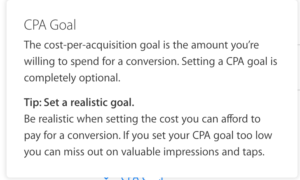 Your CPA is not guaranteed to always end up below your target CPA (Apple doesn't guarantee that the auctions you earn an impression from will produce a conversion), but overall, your actual CPA (per Apple's reports) should typically shake out around your set target CPA over time. 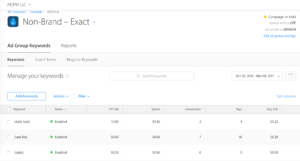 The total number of impressions your campaigns are eligible to receive will be lower when setting a target CPA, as Apple will take a more conservative approach to bidding, in order to try to achieve your CPA target over the long-term. 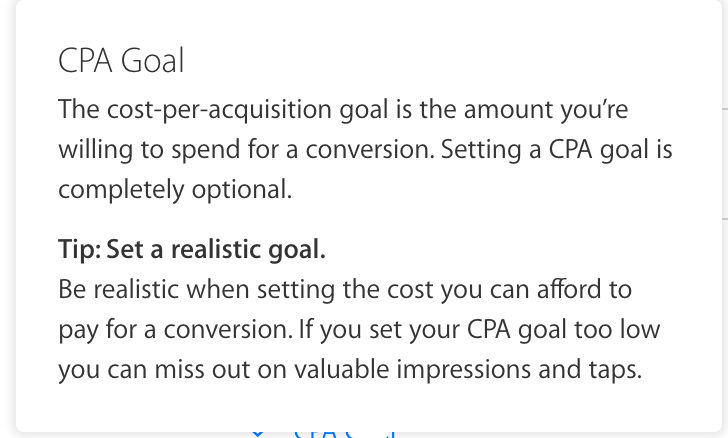 With this in mind, it's important to set a CPA target as close to or even higher than your actual CPA goal if possible, to compensate for Apple's conservative approach to bidding. 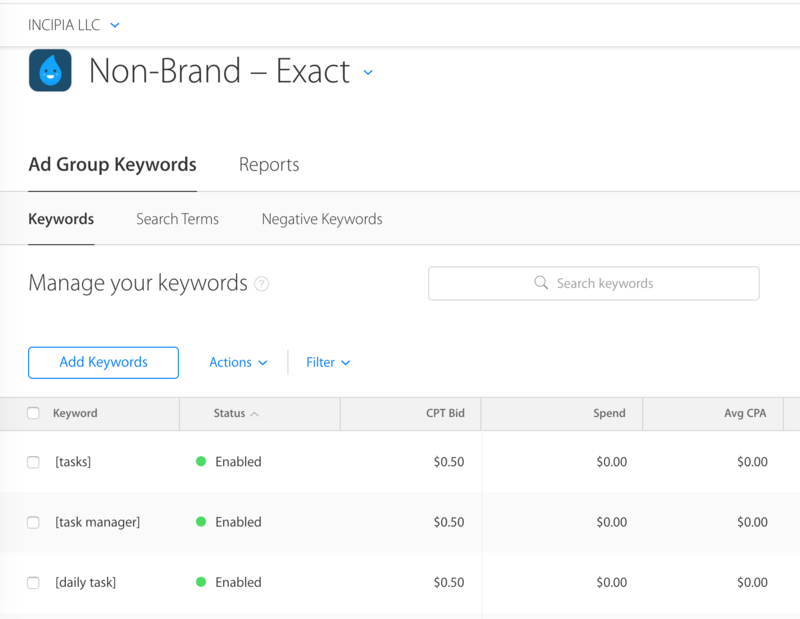 Also be sure to check reports to see whether keywords are on target and continually adjust the CPA target and your keyword mix as appropriate. Beware setting target CPAs for keywords with a low conversion rate. Using a CPA target (even with a high max CPT bid) can cause your impression share to decline sharply, as Apple's algorithm heavily factors your keyword conversion rate into whether or not to show your ad for an impression. 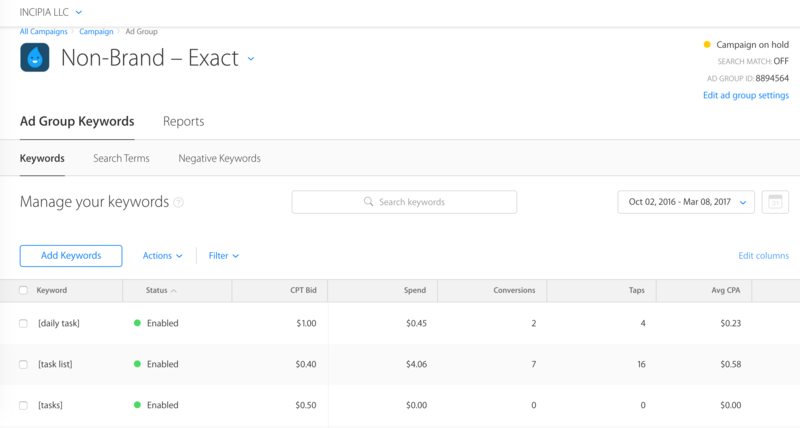 For best results when using a target CPA, only select keywords with a good conversion rate, or else work to improve the conversion rate of your keyword before setting a target or research other keyword variations before setting a target CPA. 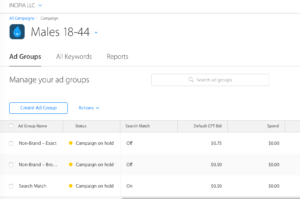 Note that target CPA is set at ad group level, and applies to all keyword within an ad group, whereas a max CPT bid is set at the keyword level. If you want to set a target CPA for an individual keyword, you will need to break that keyword out into its own ad group. If you've got a good thing going, then seek more of it! Many times we see clients using the same bid for all keywords in an ad group, even when the performance shows significant variation per keyword. It's important to take the time to look at your reports to see which keywords are doing better than others and vice versa according to your target KPI, and bid the former up and bid down or pause the latter. Raising your max CPT bid will earn you more ad impressions, which means you have more chances to earn taps, which means you have more chances to earn installs and so on; for performing keywords, you want as many impressions as possible, because your confidence in good future performance is highest for those keywords, as proven by historic data. You are happy with the conversion volume and KPI you're receiving from that keyword. The keyword's performance rises beyond your target KPI. When this happens, lower your max CPT bid until that keyword's performance is back in line with your target KPI. That said, raising your max CPT bid will generally increase your CPA and thus shrink margins, and bidding up broad match can cause you to begin match to new searches that may not convert so well, destroying margins. While this act will not directly affect your campaign performance, for clients spending significant dollars on their Search Ads campaigns, it's imperative to either use Apple's attribution API or a 3rd party attribution tool like Adjust or AppsFlyer to report performance. An attribution tool will allow you to see which campaigns, ad groups and keywords (down to match type level, which presents yet another reason to use exact match types) are driving results or not, and without this data, you're just about flying blind when it comes to true ROI. Note: for advertisers with smaller budgets, however, it may not be worth it to set up tracking a tool to be installed, as it's easier to distinguish Apple Search Ads data in iTunes Connect App Analytics when there are fewer downloads for an app all-up. Additionally, Apple Search Ads counts downloads as conversions, rather than installs, first opens or other, much more effective KPIs such as registrations or purchases. The discrepancy between downloads and installs is significant, from 10% to as high as 50% or even higher in some cases! An attribution tool will also not only provide you with better data on user acquisition, but also allow you to perform cohort analysis of your campaigns.